In travel as in life there are Disappointments. They may not be quite as deep as the disappointment Buffy the Vampire Slayer felt when her friends brought her back from the dead, thinking they were rescuing her from hell, only to discover that they actually yanked her our of heaven, but they are disappointments none the less. Sometimes disappointments occur when we have expectations that are not met, and the opposite is true; the things we didn’t know about beforehand, or had low expectations of, can turn out to be amongst the best surprises of our trip. Sometimes we are disappointed because an attraction is just downright shabby or dodgy – but even this does provide us with some funny stories to tell later, once we’ve gotten over cursing ourselves for having shelled out money for the attraction in the first place. Spoiler alert: she is really very small. Also, she is likely to be surrounded by a large crowd. The silver lining is that she is a far more intimate portrait than I had imagined, and I now further admire the skill required to paint such detail on that small scale. 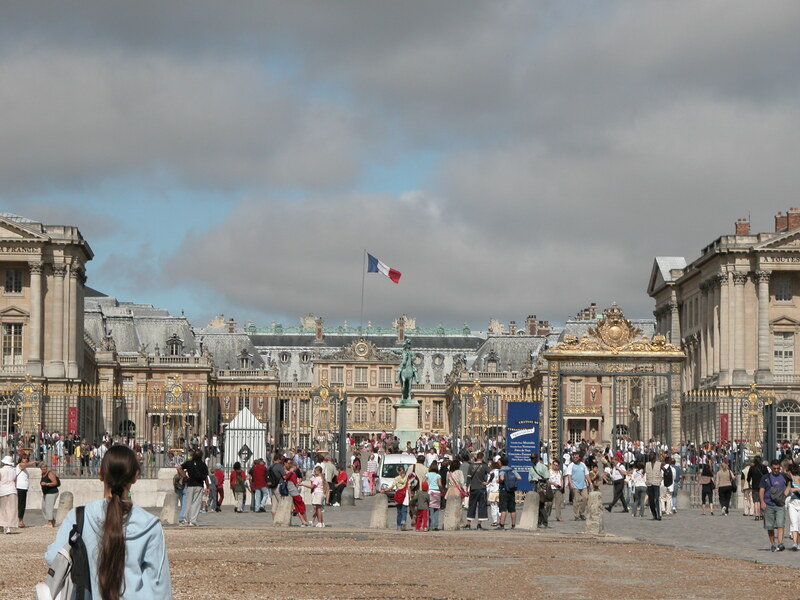 Versailles is by far the most crowded place I have ever visited (although Barcelona comes close). Inside the buildings I was swept along in a sea of people, barely able to see the furnishings and treasures in the rooms and lost my friend temporarily in the crowds. The silver lining is that I have greatly appreciated every place I have ever visited since that I have had to myself, or only shared with a few people. Obviously this is not something you have control over (unless you’re Weather Wizard from The Flash), but it can certainly turn a visit somewhere into a disappointing time. Especially if that somewhere is a garden, a boat trip, a hike, or if you were hoping to see sunlight flooding though strained glass and showering a rainbow of colours on the floor. The upside is that dark or moody days can make for better (and easier) photography than when the weather is brilliantly sunny. Plus you’re less likely to get sunburnt! Additionally the weather can certainly make a situation more dramatic and atmospheric. On a recent trip to Spain, our group walked the last 20km or so of the Camino de Santiago. As three of us entered the outskirts of Santiago de Compostela, the weather chose that moment for the heavens to open and visit a dramatic storm on us. We had to shelter under a building and debate whether to go on or not. Although we only walked 20km of the Camino, we certainly experienced in miniature what pilgrims have to face. I once visited a castle in England that was privately run. Instead of curated historically significant items on display, there was a collection of oddments: a kind of cross between an op shop and the kind of tacky ornaments someone might have at home. They were certainly not period pieces. In this same castle there was a very odd guide who literally flew at us and made me put on an antique metal helmet. She then proceeded to hit me in the side of the helmet (head) with a plastic He-man type sword to show me how well the helmet would have protected my face. If I have brain damage today, I could trace it back to the helmet banging and clanging against the sides of my head. Sure the helmet protected my head from the sword, but my head wasn’t protected from the helmet itself. My friend who I was with at the time declined to have this authentic ancient wartime experience herself. Silver lining: I’ve certainly appreciated all the well-run National Trust or Heritage sites that I’ve visited since. In a town in France my friend and I paid to enter a historic site, which turned out to be just pretty much an empty corridor. Ah, nice bricks? I suppose at least we were putting money into the local economy. Sometimes it is really, as they say, the journey and not the destination. In South Korea we spent a lot of effort to climb a mountain peak, scaling ladders in a piercing wind, all the time expecting a spectacular view from the top. It’s true the view one way was quite good, but on the other side of the peak there was a large plain featuring a hotel – not quite the wilderness I’d been expecting to gaze on. Also we felt proud of our effort to climb the peak, only to discover men selling coffee and souvenirs on the top, who probably trot up there every day. But the epic journey up was very photogenic, and it was good exercise! When you want an authentic sample of local craftsmanship, or a decent book on a historical attraction and all you can buy are tacky badly painted figurines and postcards with yellowing photos that look like they were taken in the 60’s, you experience disappointment. On these ocassions you either have to rely on your own photos for memories of what you saw, or you are left with your impression of a place in memory only. In either case you’ve certainly saved money – and you’ve certainly saved your friends and relations from feeling obliged to display a bad postcard on their fridge for an undefined period of time. I admit, I had built up in my mind an idea that Stonehenge would be a place of atmosphere and mystery and that I would be able to wander among the stone plinths and imagine ancient rituals there. What I didn’t anticipate was the rope that only allows visitors to skirt a perimeter around the outside of the stone circle. I also didn’t anticipate the multitude of other visitors, so there was certainly no disappearing into another world like Claire in Outlander. Thirdly it poured rain – which did provide a moody atmosphere – but made it difficult to juggle cameras and protect your clothes and hair from getting wet. However I managed to take a number of photos showing no other people and no rope, so I have continued to perteptuate the myth that visitors to Stonehenge can have an up-close people-free atmospheric experience. Silver lining? Well I made it to Stonehenge and came away with some iconic images. It also makes me think more about preservation of historical sites. We can’t all tread the paths and touch the stones at sites without serious wear and tear, so it’s a good thing when organisations are far-sighted and work to preserve sites for future generations. I remember standing in one of the chapels in the Church of the Holy Blood in Bruges and attempting to reverently drink in the atmosphere. All around me were tourists trying to snap a photo of everything in sight. Often tourists defy the ‘No flash photography’ or ‘No photography’ signs and sneak photos anyway, as if they had some special exemption from the rules. Sometimes in art galleries you can’t get near the paintings for the number of people who want to pose for a selfie next to every single picture. Sometimes other travellers do things or utter words that are blatantly culturally offensive and you just want to crawl under a bench. So I’ve pointed the finger at others, but I’m sure there are also times when I knowingly or unknowingly did or said the wrong thing while travelling. And sometimes travel wears us down and we’re not at our best when ultra tired. Sometimes we get sick or feel tired and can’t make the most of an opportunity. It can certainly ruin your day to have to stand in an interminable queue, especially if you get to the end of it only to find you are in the wrong queue. I never knew queueing was an art in itself until I stood in line to go to the tennis at Wimbledon. That day did contain a particualar disappointment as we stood in line for quite a while (maybe a few hours) and when we finally got in we did not even see any tennis before the covers were pulled over the courts due to the rain. However I did pick up some Wimbledon merchandise and learnt a lot about queue etiquette (unfortuantely the entry fee was non-refundable). On the only day you can visit there, they are closed. Whether it’s the Vatican, where they reserve the right to close Museums from day to day without notice, or whether it’s a palace in Thailand and it’s a public holiday that was previously unknown to you, you can turn up somewhere and find it closed on the day, when it was open the day before and may also be open the next day – it’s just not open on the only day you can get there. This has happened to me a number of times. On these ocassions you have to improvise, move on to plan B and sometimes this provides you with a surprising treat. Perhaps you, like Lucy Honeychurch in Room with a view experience disappointment when you don’t get the room with a view (and your companion doesn’t agree with you changing rooms with a man in case it puts you under some kind of inappropriate obligation). I’ve certainly been disappointed by the size of some hotel rooms, particulary when sharing a room with a friend or fellow tour member. One memorable night was spent in an Italian hotel room where we were kept awake all night by a medieval parade through the city, only to be woken early the next day by the sound of broken glass and building rubble cascading down a rubble shoot and smashing in a pile opposite our window. You don’t always have a good night’s sleep when you travel, so its fortunate when you’re super tired from traipsing around all day and you can’t help but sleep despite it all. In the end you do appreciate your own bed at home a lot once you get back to it. As they say, it’s not so much the disappointment, but what we do with it that counts. And even if it’s just rich fodder for blog posts, those travel disappointments have done their work. I find travel makes me reflect on my own society too – it makes me more thankful for certain things, while also appreciating new things I’ve learned while away. Hilarious anecdote about the helmet in DIY castle tour Jo. Loving your posts, keep it up! Thanks Helen – I even have a photo to prove it. The lady made me pose with the helmet on and holding a canon ball!